How to Make Candied Walnuts - THE OLIVE BLOGGER - Recipes your family will love! You can use this recipe for Candied Walnuts for any type of nut you prefer! They are so easy to make and can even be made ahead of time and kept in a sealed container for when needed. I used them on my Carrot Cake Trifle, which is a super easy dessert that anyone can throw together. You want to make sure you watch the nuts while they are cooking, this is not a recipe you want to leave unattended as the sugar cooks quickly and begins to crystallize (if you are not watching, it can burn easily). These Candied Walnuts only require 3 ingredients and can be adjusted if you want to add spice or change out the nut type! A great DIY gift for Holidays. in a small pan combine all ingredients over medium heat. Once butter and sugar melt together you can turn the heat up to medium high. Allow the nuts to cook in the sugar mixture for about 5 minutes, or until the sugar begins to crystallize (you will be able to smell the nuts browning at this point). 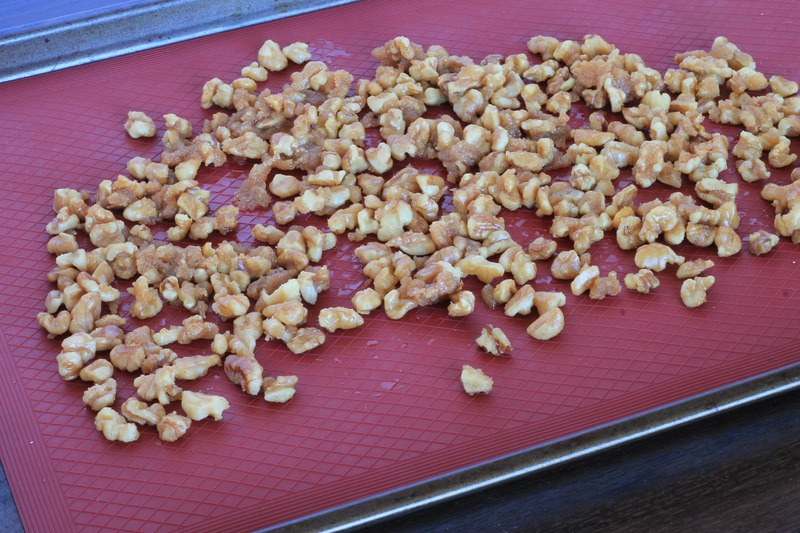 Remove from the heat and place on a silicone mat (or parchment paper) on prepared baking sheet. Allow to cool and then gently crumble with your hands. You can use this recipe for any type of nut you want to candy, and can even add in some spices to make a nice snack for when you get a craving! Enjoy. How to make Candied Walnuts – The basics you NEED to know to make any kind of candied nut! They can be used in salads, desserts, or even eaten on their own.